The exact route Hannibal, one of the greatest militarists of all time, took in 218 BC over the Alps to invade Italia has remained a controversial and unresolved question, but York geography Professor Emeritus William Mahaney believes environmental science can add much to the debate. 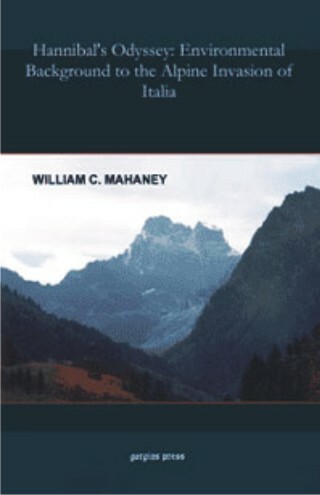 In his upcoming book, Hannibal's Odyssey: Environmental Background to the Alpine Invasion of Italia, Mahaney argues the southern route over the Col de la Traversette is the most likely path, given geological, topographical and environmental evidence that matches the description of the route in the ancient literature. The lee side of the Col de la Traversette is the only place in the western Alps where a two-tiered deposit exists. It was described by ancient Greek historian Polybius in his accounts of Hannibal’s journey as a “landslide”, but it is actually a rockfall, says Mahaney. Until Mahaney discovered the rockfall on one of his three expeditions to the Alps, the location of it was one of the missing puzzle pieces in determining Hannibal’s exact route with the Punic army, leading up to the Second Punic War (218-202 BC). “I think what is really interesting is that I’ve managed to identify some geoarcheological sites of interest that could be further explored,” says Mahaney, former director of York’s Geomorphology and Pedology Lab, previously housed in the Atkinson Faculty of Liberal & Professional Studies. Once the correct route is identified, archeologists can start excavating the area in search of artifacts that would shed more light on the history and military culture of the time. It would be even more important to archeologists than historians, he says. “Even though Hannibal was a great militarist, he left no records,” says Mahaney. “Everything we know about him comes out of Roman literature.” Polybius, who wrote his account of the journey after retracing Hannibal’s steps from Iberia to Italia 60-some years later, is considered one of the more reliable sources along with Roman historian Livy (Titus Livius), who also wrote about the route using long-gone historical texts, although he never travelled it. The great march of the Punic army under Hannibal across the Pyrénées to the Rhône River and over the Alps is still considered one of the largest and most daunting military operations in history. The discovery of the two-tiered rockfall on the lee side of the Alps, along with several other topographical indicators, has Mahaney convinced that Hannibal took the southern route through the Queyras and over the Col de la Traversette. Over the centuries, historians have argued over three main routes, each believing one of them was the path taken by Hannibal and his army, numbering some 50,000 men, horses and elephants. The southern route, however, was first advocated in the 1960s by former director of the British Natural History Museum, Sir Gavin De Beer. Several other indicators point to the southern route as the most plausible, says Mahaney. Polybius described a great view of the lowlands and a place where the army could regroup on the lee side in his accounts, as well as the presence of snow firn pack (dense snow). Such a view is only present at the Col de la Traversette, the highest of all possible mountain passes in the Alps that Hannibal might have transited. The army could have gathered on the lee side of the Col de la Traversette at the Po River catchment where there is sporadic firn pack on the east as well as the west flank. Polybius also indicated that Hannibal used timber to fire fallen boulders to clear a path down the mountain. The boulders were then doused with sour wine while still hot, which would cause them to split making them easier to move. Whereas fired rock is not present at the site of the two-tiered rockfall, it is found near a rockfall 60 kilometers to the north, below the Col de Clapier. Whether the northern rockfall could have been fired by Hannibal remains to be seen. Mahaney and his colleagues have taken samples and are having them tested using paleomagnetism to determine their age at the University of Lethbridge in Alberta.